Where in the World? Tahquamenon Falls, That’s Where! Don’t let the title of my new blog carnival fool you: I have not traveled the world! But I do love to travel, and so I started “Where in the World? 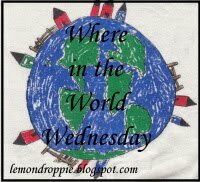 Wednesdays” to tell you about some of the places I’ve been. I may also include some tips on traveling with kids or show you some of the places around my home town, and I invite you to do the same! Last summer we spent quite a bit of time exploring the Upper Peninsula of Michigan. Ed decided he wanted to visit Tahquamenon Falls. Was it because these impressive falls are one of the largest waterfalls east of the Mississippi? Was it because this is the land of Longfellow’s Hiawatha: “by the rushing Tahquamenaw” Hiawatha built his canoe? No, it was because of the Tahquamenon Falls Brewery right next to the falls. There’s nothing Ed likes better than a good microbrewery! Leave it to Ed to plan our vacation around beer. The brown tinge to the water is not caused by all that beer; instead, it is a natural coloring called tannin from the cedar, spruce and hemlock swamps that drain into the river. And here I am, trying to look calm and relaxed on my wonderful vacation with a squirmy toddler and an ornery preschooler, right in front of the huge DANGER sign. I think I needed that beer more than Ed. Now it’s your turn! Grab a button and tell us where YOU’ve been! We want to know! ← Garage Sale Find on Take Me Back Tuesday! 14 Responses to Where in the World? 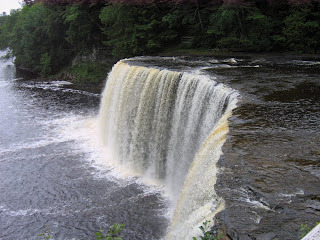 Tahquamenon Falls, That’s Where! What an interesting sounding place. You have made me realise how much of the world I still haven't seen!Best wishes and thanks for visiting.Until next time,Natasha. LOVE the new button. And love the idea. And love those falls. And if it makes you feel any better, I have a guy friend who plans EVERY vacation around beer! Fun party idea! Can we link up old posts? Otherwise, you'll have to wait a few weeks until we get back from our vacation to NYC! Great photos! I'll try to come up with a good post for next Wednesday! Okay Ginny, this is funny. Nothing like taking a vacation for a beer! That is so funny that he planned your vacation around a microbrewery!! My husband does the same thing but it is Krispy Kremes (we don't have any here). And nothing like balancing a squirmy child on your shoulders in front of a danger sign!! And great idea for a meme! I might even remember to participate some time! Sounds like fun. And Michigan isn't too far away. Maybe we'll have to think about visiting. I'm so glad that brown is tree stuff and not … well, never mind.Anyhow, I've never been there but it does look like a great place to visit! LOL about your husband's reason for wanting to go. I have some pictures somewhere from Crater Lake in Oregon of my husband and sons standing way too close to the edge of the crater…not a fun experience for the Mom!We've never been to Michigan, looks like someplace we need to add to our future travel list! It looks beautiful there but not at all relaxing. Next trip, a kids-free weekend at the beach?!? Yeah, right…. I've never been to Tahquamenon, but it looks pretty! Waterfalls are always cool.I took your idea and turned it into a guessing game to play Wordless Wednesday too. Sorry for not following directions! I'm a rebel like that.